Rosewood Leaps&Bounds A Week Of Treats​​​​​​​ is a pack of 7 different chews, bones and rolls that are irresistibly tasty for dogs. Feed as a treat or reward anytime as part of a well balanced diet. Each pack contains 7 different treats at a total of 95g. 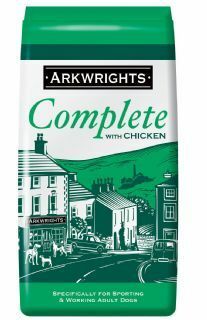 Arkwrights Complete Dog Food is a complete diet designed to suit adult working dogs that enjoy a distinctive chicken or beef flavour. BETA recipes are formulated with chicory, a source of natural prebiotics, which has been proven to help increase the number of good bacteria in the gut and help improve digestive health. Rosewood Grillhouse Crunchy Kebabs 4 pk are a low fat and high in protein savoury treats for dogs. Irresistibly tasty rawhide treats for dogs. Each pack contains 4 treats. We recommend one treat per day. Rosewood Dr.Dental Dental Brush 5 Pack With Mint Flavour are treats for fresh breath and have added calcium. One a day also helps to clean teeth. They are a healthy and hygienic treat for dogs of all sizes. Feed as a treat or reward anytime as part of a well balanced diet. Each pack contains 5 treats at 100g total. Rosewood Dr.Dental Dental Sticks With Mint Flavour are one a day dental treats for dogs that freshen breath, can help to reduce tartar and can help reinforce gums.Feed as a treat anytime as part of a well balanced diet. Rosewood Dr.Dental Dental Chew​​​​​​​ is a long lasting chewy dental treat for dogs. Feed as a treat anytime as part of a well balanced diet. Can help to clean teeth. Each pack contains 1 dental chew treat at 80g. Rosewood Dr.Dental Log Bone Superveg Broccoli & Carrot Flavour are dental treats for dogs with broccoli & carrot outside and yoghurt flavour filling. Each pack contains 2 treats and should be fed as a treat anytime as part of a well balanced diet. Purina DentaLife Oral Care Sticks is a daily oral care pack of sticks for large dogs (around 25-40kg). The sticks have a chewy porous texture. Helps to clean even the hard to reach teeth. Scientifically proven to help reduce tartar build-up and helps to reduce plaque build-up. No artificial flavourings or colourants. Pack of 12 sticks. Purina DentaLife Oral Care Sticks is a daily oral care pack of sticks for large dogs (around 25-40kg). The sticks have a chewy porous texture. Helps to clean even the hard to reach teeth. Scientifically proven to help reduce tartar build-up and helps to reduce plaque build-up. No artificial flavourings or colourants. Pack of 4 sticks. Purina DentaLife Oral Care Sticks is a daily oral care pack of sticks for medium dogs (around 12-25kg). The sticks have a chewy porous texture. Helps to clean even the hard to reach teeth. Scientifically proven to help reduce tartar build-up and helps to reduce plaque build-up. No artificial flavourings or colourants. Pack of 15 sticks. 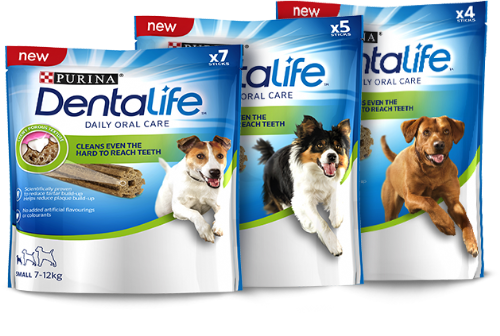 Purina DentaLife Oral Care Sticks is a daily oral care pack of sticks for medium dogs (around 12-25kg). The sticks have a chewy porous texture. Helps to clean even the hard to reach teeth. Scientifically proven to help reduce tartar build-up and helps to reduce plaque build-up. No artificial flavourings or colourants. Pack of 5 sticks. Purina DentaLife Oral Care Sticks is a daily oral care pack of sticks for small dogs (around 7-12kg). The sticks have a chewy porous texture. Helps to clean even the hard to reach teeth. Scientifically proven to help reduce tartar build-up and helps to reduce plaque build-up. No artificial flavourings or colourants. Pack of 7 sticks. Rosewood Leaps&Bounds Beef Snack Sticks are irresistibly tasty treats for dogs that are low in fat and 55% real beef. Each pack contains 6 sticks and we would recommend one stick per day. Rosewood Leaps&Bounds Hot Dog Sausages are deliciously made dog treats made with pork and chicken. Real meat flavour. Each pack contains 4 hot dog sausage treats. Rosewood Leaps&Bounds Salmon Grain Free Training Treats are training treats for dogs with no artificial colours or flavours. Made with 70% salmon. Grain free, single protein, healthy training treats - no artificial colourants or flavourings. Rosewood Leaps&Bounds Mega Meaty Grain Free Twist Treats are a helix shaped and long lasting treats with no artificial colours or flavours and is rich in turkey. 2 twist treats in a pack. Rosewood Leaps&Bounds Woof-Bar Milk Choc is a dog safe alternative to chocolate for dogs that is both safe and scrumptious and has added vitamins. Rosewood Leaps&Bounds Woof-Bar Milk Choc is a complementary pet food for dogs. We would recommend 2-5 pieces a day depending on the size of the dog. ​​​​​​​​​​​​​​Rosewood Log Bone Superfruits​​​​​​​ Avocado & Blueberry Flavour are dental treats for dogs with avocado & blueberry outside and yoghurt flavour filling inside. Feed as a treat anytime as part of a well balanced diet. Each pack contains 2 treats at 200g total. Rosewood Natural Nosh Chicken & Cheese - Bacon Shaped Treats are irresistibly natural tasty treats for dogs which are low in fat and made with real meat. The treats are high in protein and colourant free. Feed as a treat anytime as part of a well balanced diet. Rosewood Natural Nosh Chicken Fillets are treats for dogs that are irresistibly natural tasty treats. The treats are low in fat and are made with real meat. They are high in protein and colourant free. Each pack contains 100g of ​​​​​​​Rosewood Natural Nosh Chicken Fillets​​​​​​​. Feed as a treat anytime as part of a well balanced diet. Rosewood Natural Nosh Duck Fillets are treats for dogs that are irresistibly natural tasty treats. The treats are low in fat and are made with real meat. They are high in protein and colourant free. Each pack contains 80g of Rosewood Natural Nosh Duck Fillets​​​​​​​. Feed as a treat anytime as part of a well balanced diet. Rosewood Natural Nosh+ Chicken & Fish Rolls With Omega 3+6 are treats for dogs to boost the immune system and are low in fat and made with real meat and fish. They are also high in protein and colourant free. Feed to your dog as a treat in-between their normal meals as part of a balanced diet. Rosewood Natural Nosh+ Chicken Fillets With Chondroitin & Glucosamine are treats for dogs that help to maintain supple joints and are low in fat and made with real meat. They are also high in protein and colourant free. Feed to your dog as a treat in-between their normal meals as part of a balanced diet. Rosewood Natural Nosh+ Chicken Treats With Spinach & Kale are superfood dog treats full of goodness with no artificial colours or flavours. They are made with superfoods naturally containing antioxidants and omega 3. Feed to your dog as a treat in-between their normal meals as part of a balanced diet. Not suitable for puppies under 4 months old. Rosewood Natural Nosh+ Chicken Treats With Sweet Potato, Pumpkin & Carrot​​​​​​​ are superfood dog treats full of goodness with no artificial colours or flavours and made with superfoods naturally containing antioxidants & carotenes. Feed to your dog as a treat in-between their normal meals as part of a balanced diet. Not suitable for puppies under 4 months old. Rosewood Tail Twisters Chewylicious Chicken Twists are made with natural chicken fillet meat and are tail twisting irresistibly tasty treats for dogs. We recommend one treat per day, feed as a treat anytime as part of a well balanced diet. Each pack contains 8 treats of 85g. The treats are low in fat and high in protein. Rosewood Tail Twisters Chicken Wrapped Chews are delicious porkhide wrapped chews with natural chicken fillet meat. They are irresistibly tasty treats for dogs with added vitamins and are high in protein. We recommended one treat per day, feed as a treat anytime as part of a well-balanced diet. Each pack contains 7 treats at 84g. Rosewood Tail Twisters Giant Crunchy Chicken Puffs are tail twisting irresistibly tasty treats for dogs which are high in protein. Feed as a treat anytime as part of a well balanced diet. Each pack contains 20g of treats. Rosewood Grillhouse Savoury Chicken Legs 3 pk​​​​​​​ are low fat and high protein savoury treats for dogs. Irresistibly tasty rawhide treats for dogs. Each pack contains 3 treats. We recommend one treat per day. "Paw-Licking Good"
Rosewood Grillhouse Tasty T-Bone Steaks 2 pk are dog treats shaped like t-bone steaks that are low fat and high in protein savoury treats. Irresistibly tasty rawhide treats for dogs. We recommend one treat per day. Each pack contains 2 treats.